We are one of the leading manufacturers and exporters of Sulphur Granules which are used in making sulphuric acid that is further, used in manufacturing detergents, plastic, explosives, and others. The product is manufactured with high quality raw material ensuring optimum quality of the granular. This element is utilized in the creation of sulfuric acid. These are used in different industries. The element is used in the creation of steel and rubber. It is also included in the production of inorganic chemicals, matches, fumigants and glass. It is also used in explosives, cement, animal feed and adhesives. Fertilizers are also used. Producers of slat blocks, soil amendments, petroleum and sugar refining also use them. Because it is so essential, sulfur is commercially generated. The most common method is to sink wells in places with salt domes. They are also available in areas with petroleum and natural gas. Other methods used for its production are the Sicilian and Frasch processes. The Sicilian method uses ores that bear sulfur. These are piled and lit up. Heat is generated. Sulfuric elements are burned which are then collected. Sublimation is used to purify the elements. This process is used on elements obtained from crude oil, coal and natural gas. This form of the element has many applications. It is a vital component in dyes, fungicides and production of agrichemicals. It is also required in mineral extraction and waste water processing. Powdered sulfur is found in lotions and skin cream ingredients. Burned sulfur helps preserve fruits and bleach paper. The element is part of many creams, lotions and bar soaps. Many of the skin treatment ointment products in the market have this ingredient. Sulfur has elements that can eliminate acne, so it is included in their treatments. Medications for dandruff, pityriasis versicolor rosacea and warts have this ingredient. Seborrheic dermatitis and scabies can be treated with this element. Sulfur is effective because of its keratolytic, antibacterial and anti-fungal properties. Combining alcohol and sulfur can be used to treat acne and other skin disorders. Solutions with sulfur can be used to accelerate the healing of wounds. As far back as ancient Greece it was used to cure wounds. Sulfur can be used to treat hemorrhoids, arthritis, hypothyroidism and homeopathy. 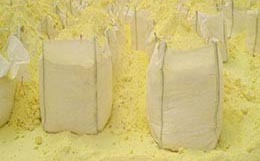 Sulphur Lump is excessively required for a variety of applications in numerous industries such as Chemical industry. We are actively engaged in offering the finest quality Sulphur Lump to our clients. As we believe in offering the best, we leave no stone unturned to acquire Sulphur Lump from the most reliable vendors only. Sulphur Lump Packing Bags is a kind of flexible Intermediate Bulk containers (FIBC bags), also known as Sulphur Lump Big Bags or Sulphur Lump Bulk Bags, bag sulphur, sulphur bags, bagging sulphur, pp bags, pp woven bags with lamination, jumbo bags. Polyproplene and Polyethylene is its main material. It applies to ship bagged sulphur for long distance or ocean transport. dustproof, moisture-proof, radiation-resistant, safety, fastness,etc. It has high strength structure, easy to load and unload.